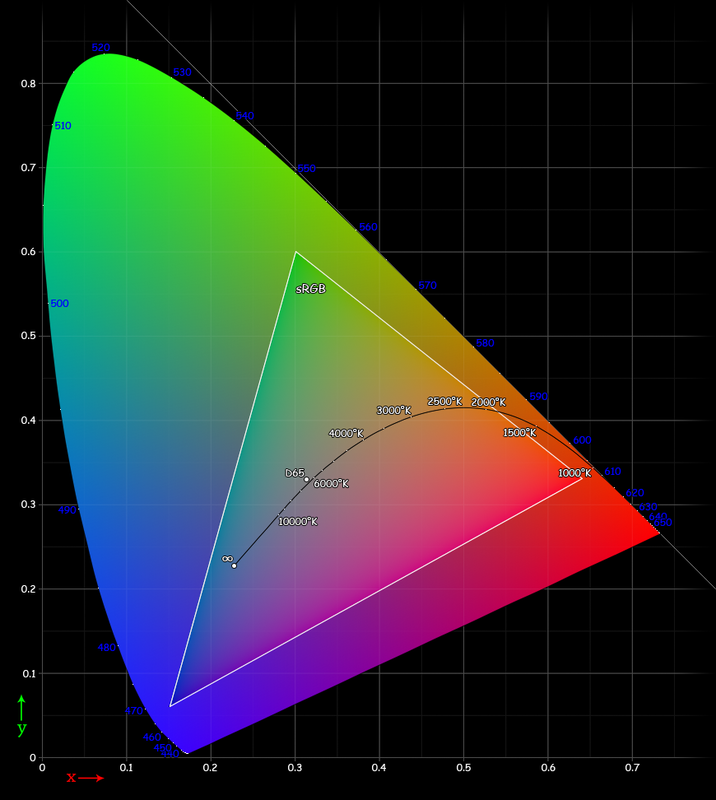 The color gamut is usually illustrated as in the following figure. I’ve reflected this to some degree in the code. Moving the mouse to the top of the control window gives green light, the bottom right corner is red, and bottom left corner is blue. There are non-trivial issues with mapping a curved triangle to a square; I’ve completely ignored these issues. In one sense, I’ve stretched and compressed the gamut as necessary to get it all to fit into a square on the control end. That said, this should be a pretty easy way to get any of the possible colors out of a set of three LEDs. I used a Sparkfun KIT-10111 tri-LED breakout board. The Arduino provides power, serial in/out, and PWM control of the red/green/blue input pins on the 10111 board. The code is given below, I learned most of it from examples and looking through the processing API. This is my first project to use processing, and I first found myself wishing I had done it in python… but in the end, processing has some very slick ways to take input and to draw stuff. Since that is 90% of what I had to do here, it turned out to be a good fit. Load the following code onto your Arduino. You can test it with the serial monitor (be sure to set the baud rate correctly). Try sending control sequences like “saaa” or “s~~~” or “s!!!”. The Arduino waits for an “s” (0x73) to indicate a control sequence. The next three bytes are red, green, and blue integers (0-255). The ASCII bytes associated with “a”, “~” and “!” are 0x61, 0x7E, and 0x21 respectively. These are equivalent to decimal 97, 126, and 33. While these don’t fill the 8-bit depth (decimal 0-255) they give you a good sense of being able to control the brightness. Of course, these examples would all have each LED light up by an equal amount (approximately). To make mostly red light up send: “s~!!”. This would be approximately RGB (126,33,33) or for web designers out there #7E2121. The mouse interface in processing writes decimal integers between 0 and 255 to each LED so you should see one LED go dark as the mouse reaches the edge of the black window. The hardest part was debugging the processing code to make sure it was sending the right thing to the Arduino. It has been a while since I’ve used C++ for any byte-level stuff. A serial LCD helped a bit, but mostly is was old-fashioned trial and error. Overall the project took about two hours to hash through (not counting assembly time for the LED kit, which was ~ 1/2 hour). Enjoy, and as always, your comments and suggestions are greatly appreciated. This entry was posted in physics and tagged arduino, led. Bookmark the permalink. Many thanks for this code, is was able to modify is a little so it now has the ability to control DMX led strips. Which turned out very nice. Excellent, I’m glad it worked for you.